Upper Devonian: fig. 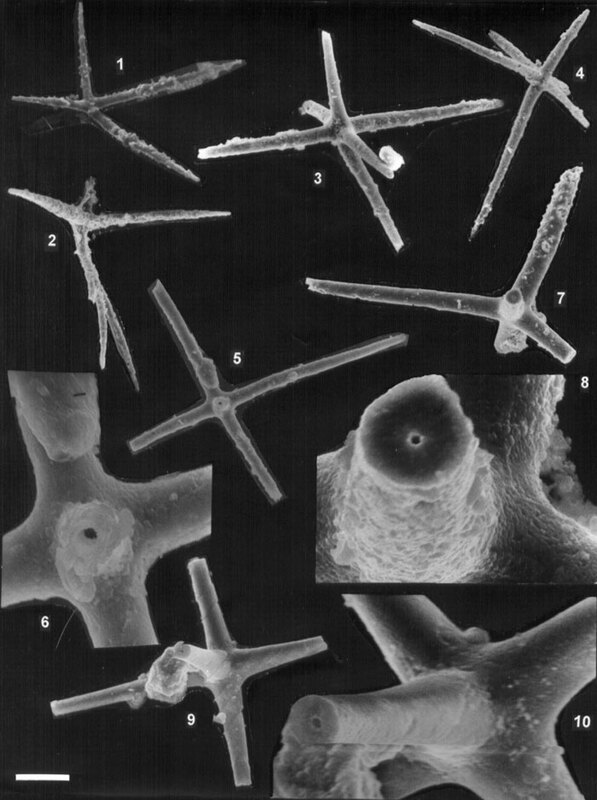 1-4, 7, 8 - Middle Frasnian, Domanik Formation; fig. 5, 6 - Upper Frasnian; fig. 9, 10 Lower Frasnian. Borehole Shuda-Yag-1003: fig. 1 - sample 78 (depth 68.4-69.3 m), fig. 2 - sample 28 (depth 106-107 m), fig. 3 - sample 56 (depth 81.6-83 m); borehole Ukhtinskaya-3B: fig. 4 - sample 158 (depth 69.6-70.4 m); the Ukhta River, sampling site no. 1, sample 7001: fig. 5, 6; the Lyajol River, outcrop no. 1904, sample 6: fig. 7, 8; the Chut River, outcrop 7, sample 1,26: fig. 9, 10. Fig. 1, 2. Triaxonida? sp.406: 1 - FF-P003/406-05114 (bar=56µm); 2 - FF-P003/406-04219 (=50µm). Fig. 3-10. Triaxonida? sp.407: 3 - FF-P003/407-04612 (=50µm); 4 - FF-P003/407-08906 (=77µm); 5, 6 FF-P003/407-13731: 5 - (=40µm), 6 - detail (=10µm); 7, 8 FF-P003/407-09817, 7 - (=67µm), 8 - detail (=10µm); 9, 10 FF-P003/407-12317, 9 - (=32µm), 10 - detail (=10µm).